Description: This handbill is a folded piece of paper, measuring 6.03 inches high and 4.42 inches wide. 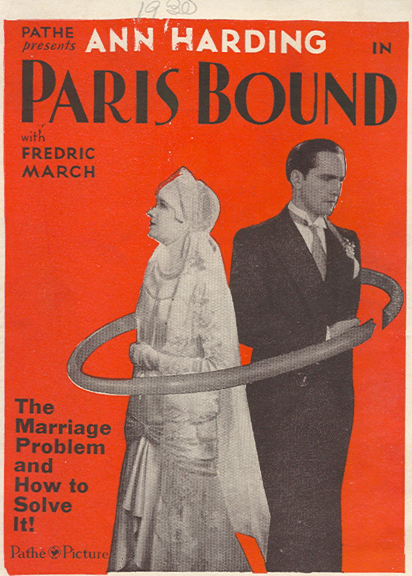 History: On March 27th, 1930, the movie Paris Bound, starring Ann Harding and Frederic Mach, opened at the Bijou. Paris Bound was released in the U.S. in August 29th, 1929. Cape Fear Museum has a number of images and artifacts that help tell the history of movie-going in Wilmington. One especially rich collection came to the Museum in 1985. At that time, a couple who had been trash picking off Kerr Avenue found a box of old movie handbills. The Museum bought the collection. These handbills are the definition of “ephemera:” something that was designed to be used for a short time and then thrown away. The fact that more than 400 from the late 1920s and early 1930s survived is astounding. Movie-going has a long and rich local history. Wilmingtonians have been going to the movies for more than a century. By 1930s, going to a show was a commonplace, affordable, form of entertainment. Paris Bound cost 15 cents for a matinee, a quarter at night, and 10 cents for kids under 10. By the 1930s, many movie theaters like the Bijou, located on North Front Street, were housed in purpose-built buildings, designed for showing films. In contrast, in the early years, Wilmington’s theaters were often opened in converted storefronts. When the Bijou opened in 1906, the theater was a tent. Despite its humble beginnings, the theater flourished and the Bijou’s owners Percy Wells and James “Foxy” Howard built a building in the 1910s, and they quickly became local movie theater moguls. From 1916 to 1933, their company, the Howard-Wells Amusement Company, controlled most of the movie theaters in the city. Although the two men’s business partnership didn’t survive the depression era, the Bijou stayed in business until 1956.